Large cottage on half the ground floor for 8 people in the owner's home located Ver sea 600 meters from the sea, tennis, mini golf, pony club, sailing school in close season. Site of the landing beaches, near Arromanches, Courseulles, Bayeux, Caen and Port en Bessin. - Dining / Living room with fireplace (sleeping 2 people with sofa). - 1 bathroom with WC overlooking a room. - 1 separate WC with washbasin, at the end of the corridor. - 1 South facing terrace with garden furniture and barbecue, sea view protected from the wind. - 1 north terrace with sea view. - large landscaped garden with lawn facing the sea. - large secure parking in the center of the property (electric gate) with independent access, in front of the south terrace. all comfort: kitchen equipped with oven, induction hob, microwave, fridge-freezer, dishwasher, TV. Laundry in closet. Necessary for baby: changing mat, high chair, potty. Weekly rental, possibility weekend (400 euros) and mid week (350 euros) excluding holidays. Everything you ever wanted to have in a holiday home. The place is fully equipped, quiet and very conveniently located. Good restaurants nearby and a nice pool to relax after a day out. We would be delighted if you would return. House, pool and view were lovely! Everything you could need, the owners were very welcoming, we had a lovely time. The house is a lovely blend of quaint French style with modern appliances and so much more. There are various areas to sit, sunbathe, dine or just admire the views of the sea. Three good size bedrooms, ample living/dining space, large bathroom (no toilet - this is separate)' a kitchen with almost every type of coffee maker, including a senseo, gadgets, dishwasher, fridge with separate freezer section and all the crockery, glasses and cutlery for double the number of guests. The French doors and shutters throughout the property create a good breeze, so we never felt it too hot or stuffy. The pool is underneath the house, so on the cloudy/rainy days it was a good option for our son. We also had our dog and the large garden with chickens at the back and the built up fish pond were an entertainment for all of us. There is also a large TV, set up with Netflix and various movie channels for us non-French speakers. What we appreciated most was the hospitality of Mr and Mdm Girard. Their welcome and guide of the property and then fresh eggs and vegetables, along with the welcome gifts was a truly lovely gesture and made us all feel welcome. 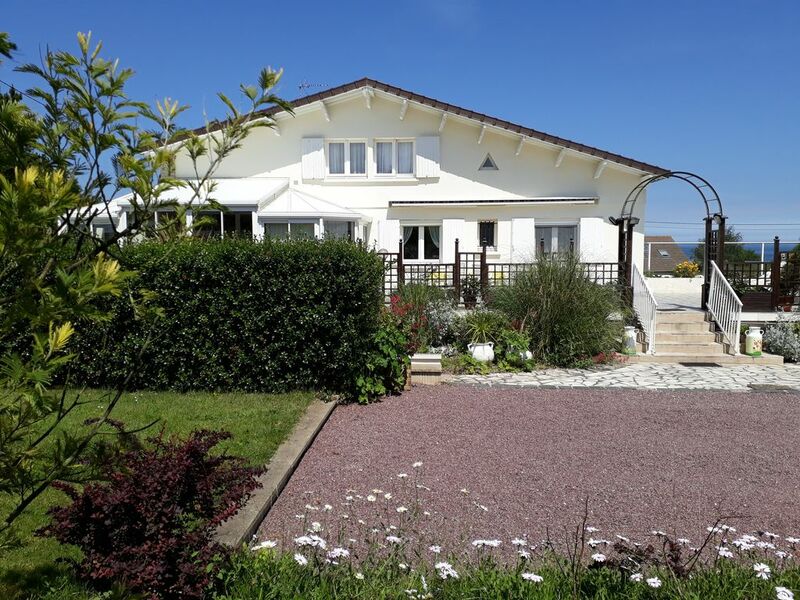 We would highly recommend this property and the owners in this lovely accommodation and the village of ver sur mer. Thank you for your useful and very kind words, for your good ideas to improve the decoration in the house and the perfect cleaning. Good comms right throughout the booking process and then met on arrival by Herve and his Wife, everything explained in perfect English and a nice welcome pack. The House was lovely and everything we needed and wanted from it, nothing was missing, the Fish and Chickens were fascinating to watch and the Dozen fresh eggs given to us were lovely. Wouldn't hesitate in recommending this place to anyone, easy to find and perfect location for the D Day Beaches. It was a pleasure to guest hosts like you. Amazing villa, close to D Day beaches. Marie-Ghislane and Hervé were there to greet it us and show us around the very clean and spacious villa and explain the ins and outs of working things. Everything and more supplied to enhance your stay. Bedrooms were large-2 doubles with wardrobes and a twin room. Pool was clean and refreshing, lots of equipment to play with and also had a shower, toilet, changing rooms and small sun terrace outside. Small village within walking distance for all needs- butchery, bakery, tabaco shop with bar and convenience store selling fresh vegetables. Also another friendly bar/restaurant at the bottom of a small hill(food in evenings not available on all nights) meals and drinks reasonably priced. As for the villa it had 2 further sun terraces- 1 at the front of the property, which was lovely in the evenings watching the sun go down over the sea, the other large more private terrace, with sun beds, tables, chairs and swingseat had a retractable sun canopy which was great when the sun was intense. Situated in a great and very pretty area in which to explore and lovely towns within 10 minutes drive for good restaurants etc. Hosts were great and generous and left you to get on with your holiday unless you needed them. Couldn't recommend it more highly and will definately be returning. Thank you for your kind and useful words. We'll be very happy to welcome you again. - sites related to the history of William the Conqueror (Romanesque abbeys, ducal castle of Caen, castle of Falaise and Bayeux tapestry). - shops within walking distance: supermarket, bakery, butcher, tobacconist, restaurant, museum, medical office and pharmacy. - port of Courseulles sur mer (fishing and yachting) 5km: sale of fishing products on the port, large market 2 times a week, many shops and leisure (Carrefour, Mac Donald) and dozens of restaurants for all tastes and all prices, amusement park for children, swimming pool with heated seawater, tasting of oysters and seafood live producers or fishermen. - numerous seaside resorts on the Côte de Nacre within a radius of 20 km with casinos, balneotherapy and thalassotherapy. - CAEN (20km): Ducal castle of the Middle Ages, Normandy museum, Memorial museum, Romanesque abbeys, horse races, theaters, cinemas, concert halls, large amusement park for children, all shops in the city center and supermarkets in peripheral. - BAYEUX (15km): Bayeux tapestry, museums, Cathedral, all shops, supermarkets (Leclerc, Carrefour etc), markets twice a week. - ARROMANCHES (10km) (Port Winston), seaside resort and artificial harbor of the 2nd World War. - OUISTREHAM (24km) seaside resort, maritime station, historical site of the 2nd World War, site of the Commemoration of the 70th anniversary. VER SUR MER has many tourist attractions combining the Coast with its seaside resorts and its memorial sites and historical cities of Caen and Bayeux. Finally come to taste our culinary specialties: tripe Caen style, andouille de Vire, oysters, seafood, fish, Norman cheeses, Camembert, Pont l'Eveque, caramels from Isigny, shortbread Asnelles, rice pudding (dessert cinnamon).